The functions that a pressure sensor performs within a design establish the basis for its selection. For all designs, major selection considerations are environment, cost, size, repeatability, redundancy, energy, and accuracy. First, for each design, ask yourself: Are there temperature compensation issues, corrosive liquids, or earthquake levels of shaking involved? What type of pressure sensor (gage, absolute, differential) best matches this design? Is there sufficient time (or money, for that matter) to calibrate the sensor? How conversant am I with calibration ins and outs? How accurate must the measurement be? Are there size constraints? 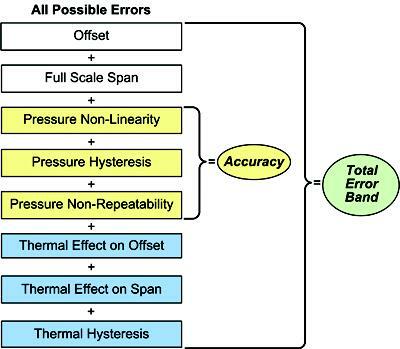 Total error band (TEB): the maximum deviation in output from the ideal transfer function over the entire compensated temperature and pressure range. How important is ease of integration? Do you want the sensor to be as close to a plug-and-play setup as possible? If so, your choice will include factory calibration and temperature compensation, all housed in packaging that is ideal for the design. Over the past several years, many precalibrated options boasting impressive repeatability have come to market. If you don't need to add proprietary algorithms that require a lot of integration time, you can implement quickly and forget. Are there critical use aspects of the application, i.e., medical use where life may depend on accuracy? For the simplest solution involving unamplified, uncompensated, mV output, along with small size and board mounting, a basic sensor is the natural choice. For harsh environments, a heavy-duty solution may be the only possibility. In between the two, accuracy required typically dictates the type used. There are performance/cost tradeoffs at every junction. Considerations include accuracy, repeatability, consistency, and reliability. The performance level impacts the importance you place on each of these elements during the selection. What are the environmental realities? Corrosion, temperature extremes, and humidity all play an important role in pressure sensor choice. Humidity impacts the sensor materials used. For example, some sensor plastics soak up moisture before the reflow process, and they fall apart as a result. Gels inherent in some basic sensors may burn in the soldering process, and some sensors lack stability after soldering -- and may not gain it back for weeks. By carefully matching the environment and the sensor characteristics, you will ultimately save time and money.